Beijing: China's first space station is expected to come crashing down to Earth within weeks, but scientists have not been able to predict where the 8.5-tonne module will hit, a media report said on Tuesday. The US-funded Aerospace Corporation estimates Tiangong-1 will re-enter the atmosphere during the first week of April. The European Space Agency says the module will come down between March 24 and April 19, the Guardian report said. In 2016, China admitted that it had lost control of Tiangong-1 and would be unable to perform a controlled re-entry. Aerospace in a statement said that there was "a chance that a small amount of debris" from the module will survive re-entry and hit the Earth. "If this should happen, any surviving debris would fall within a region that is a few hundred kilometres in size," said Aerospace, a research organisation that advises government and private enterprise on space flight. It warned that the space station might be carrying a highly toxic and corrosive fuel called hydrazine on board. The statement said the module is expected to re-enter somewhere between 43 degrees north and 43 degrees south latitudes. The chances of re-entry were slightly higher in northern China, the Middle East, central Italy, northern Spain and the northern states of the US, New Zealand, Tasmania, parts of South America and southern Africa. However, Aerospace insisted the chance of debris hitting anyone living in these nations was tiny. 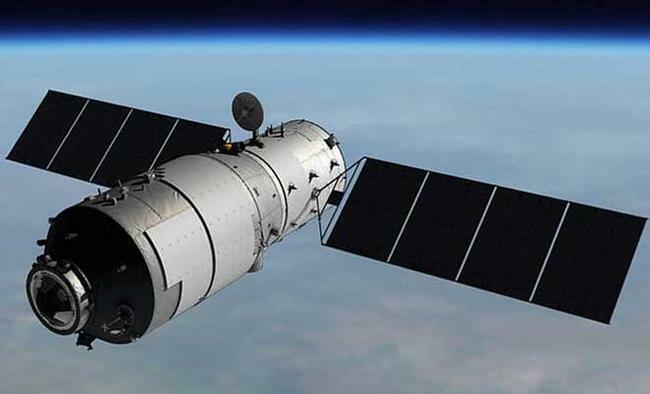 The Tiangong-1 or Heavenly Palace lab was launched in 2011 and described as a "potent political symbol" of China, reports the Guardian. It was used for both manned and unmanned missions and visited by China's first female astronaut, Liu Yang, in 2012. In 1991 the Soviet Union's 20-tonne Salyut 7 space station crashed to Earth while still docked to another 20-tonne spacecraft called Cosmos 1686. They broke up over Argentina, scattering debris over the town of Capitan Bermudez. Nasa's 77-tonne Skylab space station came hurtling to Earth in an almost completely uncontrolled descent in 1979, with some large pieces landing outside Perth in Western Australia.